The Resident Tourist: Super Bowl Sunday in NYC . . . I'm thinking if you're a super fan, you probably already have plans for the game. But if you're still looking for a fun spot to watch the game and feast with friends, I've got some foodie suggestions of where you can spend your Super Bowl Sunday. If you're craving classic football food, try DBGB for beer, hot dogs, and special sliders. Plus they'll be playing the game on a 100 inch screen. In the mood for Mexican? Empellon Taqueria will be screening the game while serving up chips and guac, queso fundido, and a selection of tacos. Watch the game on screens set up throughout the restaurant, while you feast on roast pig, rustic sides, and pitchers of beer. If you prefer to watch from home but haven't planned a menu, Birds & Bubbles will do it for you. 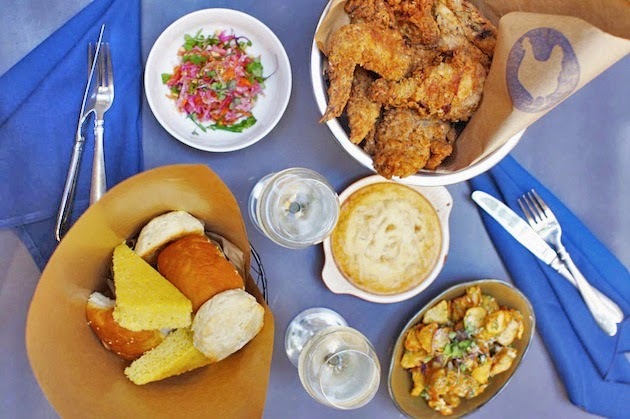 They're offering fried chicken takeout packages with all the southern sides. For the pizza lovers, Ribalta is showing the game on a seventeen foot screen and offering $50 all-you-can drink wine and beer.